Former Rep. Tony Perkins, who represented Central in the state House from 1996 to 2004, has endorsed Col. 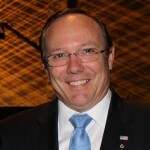 Rob Maness for the United States Senate in the Nov. 4 primary. Maness was one of the candidates Perkins honored at an old-fashioned political rally at his home off Liberty Road in Pride Saturday. More than 250 residents attended. Perkins said Maness is the true conservative in the race and has the best chance to defeat Sen. Mary Landrieu in the Dec. 6 runoff. He cited Maness’ record as a B-1 bomber aviator and a Wing Commander and his ability to lead men in combat. Maness gave an inspirational talk and emphasized the necessity of replacing Landrieu and stopping the lawlessness of the Obama Administration. Other speakers included Sheriff Sid Gautreaux and Central Mayor Jr. Shelton. The center of attention was the Duggar family, including Jim Bob and Michelle Duggar and a number of their children. The Duggars are the subject of the hit reality show, 19 Kids and Counting, about day-to-day life in their family.